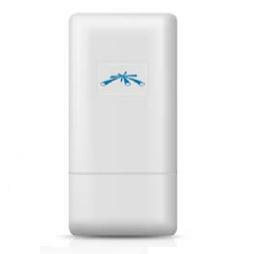 Although approximately half the size of the original Ubiquiti Nanostation, NanoStation Loco still exhibits outstanding antenna performance. The NanoStation Loco5 contains a 13dBi dual-polarity internal antenna and will operate from 5475MHz to 5825MHz. NanoStation Loco has been proven in extreme temperature and weather conditions. Additionally, it has advanced ESD/EMP immunity design to protect against common outdoor radio and ethernet failures and eliminate truck-rolls for carriers. NanoStation Loco5 is built on a 160mW radio with -93dBm sensitivity and an integrated 13dBi antenna.